Choosing the best tennis bags is a fun, but challenging, decision for all tennis players! Our racquet bag is the keeper of all we hold dear: our racquets, shoes, gear, laptops, water bottles, tennis gear and so much more! Do you throw your bag in the trunk of your car and just carry to the court? Or do you carry it around the world, as I do, and often use it as my only bag for the day. Here we choose the top tennis bags for men & women and review Babolat tennis backpacks, Nike tennis bags and Head Tennis bags. Babolat Team Line Maxi Tennis Backpack – I have this bag and LOVE it!!!! I really can’t say enough good things about it – and neither can all the people who compliment me on it every time I get on the court. I carry it around the world (as my carry on bag) and it holds everything. Three racquets, laptop, shoes, water bottle and tons of other stuff. The bag has lots of pockets, both inside and outside and, as it gets pretty heavy, the waist and chest straps make it so much easier and lighter to carry. My racquet is very well protected (especially by the grip cover and the Thermo Guard 2.0 compartment) and I can put this bag in an airplane overhead compartment or even under the seat if I remove the racquets. The Babolat tennis backpack has two very minor design flaws. The laptop compartment strap is too short for a 15" laptop, as it’s designed more for an iPad. This doesn’t really matter because all laptops will still fit in the padded compartment and be protected, but you can’t use the strap to lock them in. The second minor flaw is the outside top pocket zips all the way around, meaning you can’t open it while the backpack is on one shoulder and you’ll have to remove it to use that pocket. But there are plenty of other pockets to use on the bag. This video below gives a great overview of the bag and all its awesome features. Nike Court Advantage Tennis Backpack – This backpack is one of the most popular on Amazon and comes in two different color combinations. Some of its unique advantages are it holds two racquets with a padded separator between them and the small leather details that really upgrade the look from a typical sports bag. The bag has plenty of space to store 2 racquets, a large compartment to hold apparel and bigger gear, and a large, ventilated pocket to store all of your tennis accessories and shoes. There’s also a small accessory pocket in front to hold you personal belongings and side slip pockets that hold a water bottle or ball of cans. A coated bottom protects your bag from moisture invasion and the hard court surface. The bag offers the the options of padded and adjustable shoulder straps or the carrying handle at the top. Reviewers say, "With one racket you could fit a pair of tennis shoes. With 2 or 3 rackets it does not have enough room. " HEAD Djokovic x2 Racquet Backpack – another clean and minimalist design with round edges for the Djoker fan! It offers one main padded compartment for racquets, two side pockets, a ventilated shoe compartment at the bottom and padded straps. A front zipper pocket provides quick access to smaller things as you need them. The Head backpack can hold 2 racquets. Wilson Tour V Tennis Bag – The Tour V tennis bag can hold multiple racquets and offers 3 main compartments for equipment and apparel as well as 4 large exterior side pockets for personal storage. One of the exterior pockets has a felt lining for those items you need to keep safe, like a cell phone, head phones or tablet. The molded structure helps the bag keep it’s shape whether it’s full or just has a few items inside. For players constantly worried about the weather, or if you leave your bag in hot car for any period of time, the thermo guard 2.0 compartment, which holds 4-5 racquets, protects your tennis equipment safe against extreme heat, humidity and moisture. The Tour V offers multiple carrying options and can be used with the grab handle, padded backpack straps, or adjustable tote handles for your hands or over your shoulders. The Tour V comes in Black/Green or Gray/Orange color combinations. Do you carry the bag all day, such as on a subway, or to travel. Or do you generally just throw it in the truck of your car and carry it to the court? Do you need to carry your laptop with your tennis equipment? Do you prefer a backpack style, tote or tournament type bag? How many racquets do you want to carry? How protected do you want your racquets (if very protected, make sure to choose a bag with special heat protection or padding in the racquet compartment)? Which player’s name do you want on your bag? For a die hard Nadal fan, you can’t very well carry a Djokovich backpack, right? 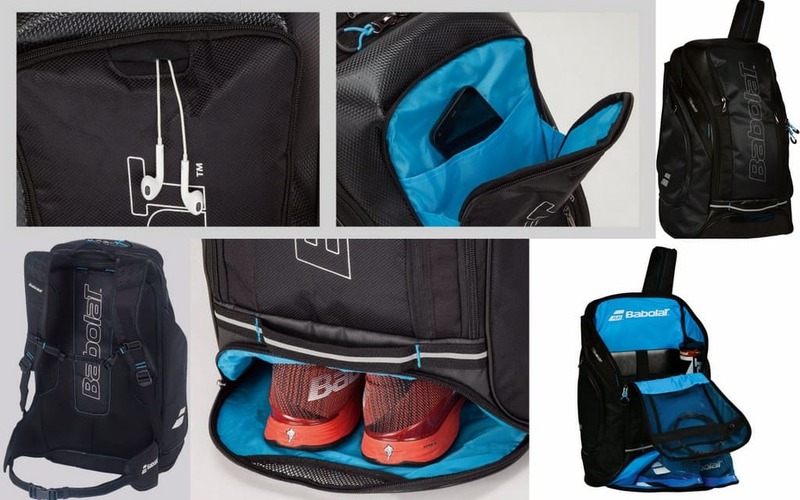 There are no shortage of amazing tennis tennis bags from which to choose, and you can see how much thought has gone into the design of each of these bags, all targeted to tennis players. Whether you are a weekend club player, a beginner, a tournament player – or a wanna be tournament player, like myself, who travels and plays all over the world, there’s a definitely a perfect tennis bag for you!